We’d love your help. Let us know what’s wrong with this preview of Moxy Maxwell Does Not Love Stuart Little by Peggy Gifford. It wasn't as if Moxy Maxwell hadn't tried to do her summer reading. She and Stuart Little had been inseparable all summer, like best friends. But now its the end of August--the day before fourth grade. And if Moxy doesn't read all of Stuart Little immediately, there are going to be consequences. Illustrations. To ask other readers questions about Moxy Maxwell Does Not Love Stuart Little, please sign up. This first novel for kids was a little disappointing; I was eager to read it because my mate's dad's name is Stuart Little and I thought it might be a good gift. Basically, Moxy is a little girl with moxie who keeps putting off her summer reading assignment and does quirky things. I think the author underestimates the reading capabilities of her audience...some chapters were a sentence or two long, or a paragraph or two, and it was trying a little hard to be "cute," especially with a fourth grade This first novel for kids was a little disappointing; I was eager to read it because my mate's dad's name is Stuart Little and I thought it might be a good gift. Basically, Moxy is a little girl with moxie who keeps putting off her summer reading assignment and does quirky things. I think the author underestimates the reading capabilities of her audience...some chapters were a sentence or two long, or a paragraph or two, and it was trying a little hard to be "cute," especially with a fourth grader as a main character. None of these chapters served to do anything but be disjointed. I think the author was trying to demonstrate the flighiness of Moxy, but the Clementine books by Sara Pennypacker do a much better job of showing ADHD tendencies. And one more thing was weird--the paper was so thick that I kept thinking I had more than one page every time I tried to turn it. This book needs to be read for the chapter titles alone -- the titles and the text had me in stitches! And the photographs that document the storyline are hysterical! I will definitely be reading this aloud to my 5th graders, or, because of all the visuals, let a group do a Book Club conversation on it. A friend told me to look for more Moxy Maxwell books -- I look forward to that! Have you ever had a book you dreaded reading and you avoided it at all possible costs? Well, you won't want to put this fun and simply written book down! The pictures and story are great! True life as a nine year old girl! Loved it! This wasn't a top favorite like I had hoped. How could I not love a book centered around one of my childhood favorites, Stuart Little? Yet while I didn't love it as much as I wanted to, there were some parts that I found amusing and endearing. My library classes enjoyed it quite a lot - even many of the boys. They thought the short chapters were fun and particularly loved chapter seven, which is just one word long. :) Reading this also inspired quite a few of my students to read Stuart Little. S This wasn't a top favorite like I had hoped. How could I not love a book centered around one of my childhood favorites, Stuart Little? Yet while I didn't love it as much as I wanted to, there were some parts that I found amusing and endearing. My library classes enjoyed it quite a lot - even many of the boys. They thought the short chapters were fun and particularly loved chapter seven, which is just one word long. :) Reading this also inspired quite a few of my students to read Stuart Little. So while this wasn't a top favorite, it was definitely worth reading. From my perspective, I thought Moxy was just a touch annoying. I think her mother showed a lot of patience with her - maybe too much! Although I did enjoy Moxy's creativity and her interest in words. I also enjoyed the photographs used as illustrations in the book, and the way the information from those photographs was incorporated into the audio version. I know some people have felt that some of the specifics from Stuart Little should have been worked into the story more - that the way it was written, Moxy could have been avoiding reading almost any book. I felt like Stuart Little was almost like a character in the story - but one that we learn almost no specifics about because Moxy hasn't started reading the book yet. But he is always there hanging around in the background waiting to be noticed. Moxy carries the book around with her everywhere. In fact, the librarian in me shuddered at all of the things that happen to the book throughout the story: lemonade, ants, a swim in the pool, and a stint under Moxy's bed after she "cleans" her room. Speaking of Stuart Little being lost under Moxy's bed, that was one place where I felt that Peggy Gifford really dropped the ball. As readers, we can see Stuart Little under Moxy's bed in the photo of Moxy's "clean" room, but Moxy doesn't realize she's left him there. Later on, she wonders where he is and realizes she hasn't seen him for a few days. But then when she finally sits down to read the book, there is no mention of her needing to look for it. Why all that build-up for nothing? I honestly think Gifford planned something there and then forgot to include it in her rush to the end - or at least that's how it felt to me. Moxy caries the book Stuart Little around with her all summer, but never manages to open the book and read it. Moxy is very creative with her excuses and her excess thinking and planning to read Stuart Little often stop her from doing just that. The audio was fun-short. And Moxy is a fun cute character that can rival Junie B. Jones or Allie Finkle any day. It wasn't as if Moxy hadn't tried to do her summer reading. She and Stuart Little had been inseparable all summer, like best friends. If Stuart Little wasn't in her backpack, it was in her lap . . . or holding up the coffee table . . . or getting splashed when Moxy went swimming. But now it's the end of August—the day before fourth grade. And if Moxy doesn't read all of Stuart Little immediately, there are going to be "consequences." It may look like Moxy is doing nothing, but actually she is ver It wasn't as if Moxy hadn't tried to do her summer reading. She and Stuart Little had been inseparable all summer, like best friends. If Stuart Little wasn't in her backpack, it was in her lap . . . or holding up the coffee table . . . or getting splashed when Moxy went swimming. But now it's the end of August—the day before fourth grade. And if Moxy doesn't read all of Stuart Little immediately, there are going to be "consequences." It was okay book. The chapters aren't long, they are short. I thought the book was hilarious in some ways. I like the story of Moxy because she found different ways to avoid reading Staurt Little over the summer which was funny. My favorite was about the peach and how she though of planting a peach orchard. That was funny. This book is so fun. Very short chapters help the pace to fly by, and the escalation of disaster is quite funny. Funny, nothing objectionable—good family or class read-aloud. Great vocabulary. Full disclosure- I read the first 20 pages or so, skimmed through and then read the last chapter. I can see kids liking this book. Reminds me of Junie B. Jones without the annoying vocabulary. I love the way distraction is shown, I have had many students like this. I hated this book and I barely have anything good to say about it. I liked it just because at least it's based on a true story. The bad stuff about it is that it's EXTREMELY BORING and almost no interesting story. The main plot is a girl in the summer who has to read Stuart Little and hates it, but she loves swimming. I do not recommend this book to anyone who doesn't want to be very bored. Okay, let's start with the title. Moxy Maxwell Does Not Love Stuart Little. But I love Moxy Maxwell. And I dare you to read this book and not love Moxy too. Second, have you seen that cover? 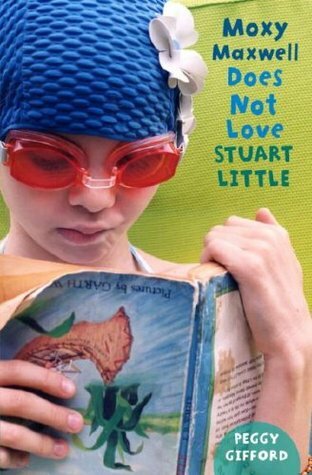 It makes me laugh every time I look at it--Moxy's face, her scrunched up lip, the goggles and swim cap--and the poor, battered, upside-down copy of Stuart Little. This is a gorgeous, fun package of a book. Okay, now the plot. Moxy Maxwell was supposed to read Stuart Little over the summer. She is going to have Okay, let's start with the title. Moxy Maxwell Does Not Love Stuart Little. But I love Moxy Maxwell. And I dare you to read this book and not love Moxy too. Okay, now the plot. Moxy Maxwell was supposed to read Stuart Little over the summer. She is going to have a quiz on Stuart Little on the first day of school. The first day of school is tomorrow. And Moxy still hasn't started the book. It's not that she doesn't like to read--on the contrary, Moxy loves reading. But she doesn't like to be told WHAT to read and when. So Moxy comes up with brainstorm after brainstorm to keep her from having to read Stuart Little--including a brilliant idea that is sure to raise enough money to pay for her college education and possibly dental school too if that's the Career Path she happens to choose--and once her parents see how accomplished she is, they wouldn't make her read a book about a mouse--unless she wanted to, that is. Moxy is hilarious. She is like the real, actual kids you know. She is probably like you were when you were a kid, and like you would be now if you weren't too grown-up to admit it. Moxy Maxwell Does Not Love Stuart Little written by Peggy Gifford, illustrated by Valerie Fisher and published by Schwartz and Wade in 2007 tells the story of 9 year old Moxy Maxwell and her plans for summer. All summer long Moxy has put off reading the book Stuart Little so that she can do other things. This eventually backfires on Moxy, when her mother refuses to let her perform her synchronized swimming routine with her friends, unless she finishes the book. Disaster inevitably ensues as Moxy Moxy Maxwell Does Not Love Stuart Little written by Peggy Gifford, illustrated by Valerie Fisher and published by Schwartz and Wade in 2007 tells the story of 9 year old Moxy Maxwell and her plans for summer. All summer long Moxy has put off reading the book Stuart Little so that she can do other things. This eventually backfires on Moxy, when her mother refuses to let her perform her synchronized swimming routine with her friends, unless she finishes the book. Disaster inevitably ensues as Moxy attempts to get away with her reading, with the help of her twin brother and younger sister. Overall I really enjoyed this book, I found myself laughing out loud at certain points in the text. I think that this book would be ideal for children in 3rd grade and above, since Moxy is around that age herself. I could see this book being humorous to both children and obviously adults, since I myself found it to be funny. The photographs that serve as the illustrations for this story add to the humor, and do not take too much away from the story, or give too much away. I think that this is ideal for a transitional novel, since it is trying to get children away from focusing on the pictures, and trying to push them to pay more attention to the text. I gave this book four out of five stars, and I would highly recommend it to any one ages 9 and above. Who here loves to read? Do you like to pick out your own books – kind of like today, where Sharon and I will tell you about some great books, and you will choose your own? Who loves to read when people tell them they have to read something? When people tell you you have to read something that you don’t want to read? Welcome to Moxy Maxwell’s world. She starts fourth grade soon – as in, tomorrow – and Moxy was supposed to read Stuart Little over the summer. Obviously, she didn’t do that. And obviously, she doesn’t want to do that, even though fourth grade starts tomorrow and she really needs to do that otherwise she’s going to get in huge trouble. Unlessssssssssssssss…. She can think of a good REASON why she didn’t read it. Like: she was planting a peach orchard in the garden and so she couldn’t read Stuart little. She was cleaning her room and so she couldn’t read Stuart Little. She was training her dog and so she couldn’t read Stuart Little. Find out if Moxy ever reads Stuart Little in Moxy Maxwell Does Not Love Stuart Little. Kids Will Not Love Moxy Maxwell. I, a well-read adult parent of preteen and younger children, did enjoy the first two (haven't read the third yet). They were very funny, from my perspective and with my reading background. The first was very amusing, the second less so but kind of touching. But -- and this is a big but for books ostensibly aimed at children -- this series is the kind of literary-magazine favorite that is not actually written to entertain children but to entertain their parents. MO Kids Will Not Love Moxy Maxwell. I, a well-read adult parent of preteen and younger children, did enjoy the first two (haven't read the third yet). They were very funny, from my perspective and with my reading background. The first was very amusing, the second less so but kind of touching. But -- and this is a big but for books ostensibly aimed at children -- this series is the kind of literary-magazine favorite that is not actually written to entertain children but to entertain their parents. MOST KIDS DON'T FIND THIS SORT OF BOOK FUNNY. Ok, maybe I should not speak for them, but my kids (who read A LOT) were just perplexed by the first one and wouldn't even open the second. They didn't get the chapter titles, they didn't understand what was funny about the photographs or their titles, they didn't relate to the parents' reactions, they didn't think Moxy was particularly appealing--not bad enough to be good, not wacky enough to be funny, and the kids who might act like she does didn't see the parallels. I am on the hunt for titles to recommend to developing readers. The good: a child admits they hate their summer reading book, and that being forced to read can actually have an effect on a child who loves to read otherwise. I enjoyed that there were to be consequences if Moxy did not finish the book (they were to be tested at school, she could not attend the after party at a swim demonstration). The bad: I thought Moxy had a little too much "moxy" and it made her unlikeable to me. I also had a ve I am on the hunt for titles to recommend to developing readers. The good: a child admits they hate their summer reading book, and that being forced to read can actually have an effect on a child who loves to read otherwise. I enjoyed that there were to be consequences if Moxy did not finish the book (they were to be tested at school, she could not attend the after party at a swim demonstration). The bad: I thought Moxy had a little too much "moxy" and it made her unlikeable to me. I also had a very hard time believing that Moxy was 9. At times, she seems way too mature in her plotting for the future. I didn't think she was cute or clever. There was way too much attention given over to the dogs-and lets face it, I was not reading to read about the dogs. The climax was a little off putting. Kind of like, oh, yeah, I DO like Stuart Little. And the twin with the camera who does not interact with the other characters comes off as strange. It's not that Moxy hates to read. She just hates summer reading! She wants to read what she wants. This book takes place on August 23rd, the day before 4th grade starts. Moxy has still not read Stuart Little. Her mother has forbidden her to go to her synchronized swimming show tonight (which she has been practicing all summer for!) unless she finishes reading. Unfortunately, Moxy spends most of the day thinking up plans to keep her from reading which ends in disaster. Her brother Mark is there t It's not that Moxy hates to read. She just hates summer reading! She wants to read what she wants. This book takes place on August 23rd, the day before 4th grade starts. Moxy has still not read Stuart Little. Her mother has forbidden her to go to her synchronized swimming show tonight (which she has been practicing all summer for!) unless she finishes reading. Unfortunately, Moxy spends most of the day thinking up plans to keep her from reading which ends in disaster. Her brother Mark is there to take pictures of the events throughout the day (which are scattered around in the book). Moxy was a really funny character. She is very motivated and excited about the future. She has 3 pages of things she wants to do when she grows up. What do you think happens when her mom comes home and finds out she didn't read the book?????? I would recommened this book if you like reading comedies. The method of storytelling in this novel--apparently candid snapshots of Moxy's inspiration, getting into trouble--is creative. The story itself is not. Moxy is fiercely independent, sassy, and crafty. She tries to avoid reading a homework assignment. I wonder why the author insisted on hating on Stuart Little, though. Seems to me, she's creating a legion of readers who will be reluctant to try Stuart Little now. Her spunkiness is cute but unoriginal. She's the type of character who borders on b The method of storytelling in this novel--apparently candid snapshots of Moxy's inspiration, getting into trouble--is creative. The story itself is not. Moxy is fiercely independent, sassy, and crafty. She tries to avoid reading a homework assignment. I wonder why the author insisted on hating on Stuart Little, though. Seems to me, she's creating a legion of readers who will be reluctant to try Stuart Little now. Her spunkiness is cute but unoriginal. She's the type of character who borders on being a bad-influence-friend, like Judy Moody. Don't ban the book because Moxy is sassy--just be aware of her general demeanor before handing the book to a difficult eight year old. 1. This book belongs in the genre of junior contemporary realism. 2. Moxy is busy. She has many things to do over the summer and not enough time to read a book about a silly mouse. Moxy uses the whole summer procrastinating her reading assignment, but when she finally gets around to reading it, she loves it! 3. The area for critique is content. the content in this book is easy reading for young readers. Because of the content and the easy reading level this is a great book for the beginning of th 1. This book belongs in the genre of junior contemporary realism. 3. The area for critique is content. the content in this book is easy reading for young readers. Because of the content and the easy reading level this is a great book for the beginning of the fifth or sixth grade school year. This book is also a great read because the subject is so relevant to young students. Many students would love to read about the silly things Moxy does to procrastinate her school work, they may even add some of her ideas to their own list. English/ Reading: motivation to read. beginning/end of the year reading assignments. Before I was half way through the book, it was getting a bit old. The chapter headings called "in which..." were too frequent and the gags weren't funny any more. Moxy was just plain annoying. I found myself wondering why everyone put up with her bossiness and laziness. I was distracted by her mother's indecisiveness and poor parenting. I kept wishing her Mom would spank Moxy's behind. Moxy Maxwell loves to read, but she does not love to read Stuart Little. She's had all summer to read the book that her teacher assigned for summer reading, but Moxy hates being told what to read (or do, for that matter). So while she takes the book everywhere she goes, she never quite gets around to reading it and all of a sudden it's the last day of summer. Her mother can only think about Stuart Little, but Moxy can think of many other ways to occupy her time--and she does. I liked it and I di Moxy Maxwell loves to read, but she does not love to read Stuart Little. She's had all summer to read the book that her teacher assigned for summer reading, but Moxy hates being told what to read (or do, for that matter). So while she takes the book everywhere she goes, she never quite gets around to reading it and all of a sudden it's the last day of summer. Her mother can only think about Stuart Little, but Moxy can think of many other ways to occupy her time--and she does. When I was in elementary school my mom wouldn't let me read the Ramona Quimby books because she thought I would take a fancy to Ramona's mischief and act out some of the stunts she pulls. Mom was specially wary of the one where RQ gets a hold of a basket of apples and takes a bite out of each one then puts them back. I thought my mom was "overreacting" just like when she confiscated my NWA tape in the 6th grade. But after reading "Moxy Maxwell Does Not Love Stuart Little", I can kind of see her When I was in elementary school my mom wouldn't let me read the Ramona Quimby books because she thought I would take a fancy to Ramona's mischief and act out some of the stunts she pulls. Mom was specially wary of the one where RQ gets a hold of a basket of apples and takes a bite out of each one then puts them back. I thought my mom was "overreacting" just like when she confiscated my NWA tape in the 6th grade. But after reading "Moxy Maxwell Does Not Love Stuart Little", I can kind of see her logic. If I had a kid, I would only hope that little hypothetical s/he wouldn't take any cues from Moxy. This kid's resourceful, quick & clever but unfortunately she is a terrible role model for efficiency. In an age where people are notorious for putting off work, Moxy will be right there to help you justify your procrastination. All in all it makes for super quick and funny read.